The New Way To Sell Better! Be it local or global, businesses worldwide are driven by the primary goal of constantly improving their revenue numbers. In order to achieve this goal, most businesses focus on increasing their customer base by employing the various marketing strategies that are out there. The reason is simple; the more the number of customers, the more sales they will bring, resulting in an increased revenue for the business. Yes, this is the right way to move forward. But, unfortunately many businesses miss the trick of maximising their returns from every customer while being busy in their struggle to add to their customer list. So, as an optician, making the most of every customer you have is as important as introducing a new customer to your business. Imagine a scenario where you are earning 10 percent more from each of your customers. Wouldn’t it be wonderful if you are able to achieve this? Yes, it definitely would be. Strategies like upsell and cross-sell follow this same principle of leveraging each one of your customers. These are universally trusted concepts and have helped businesses world over to boost their revenues. But, what exactly do we mean by cross-selling or upselling in an optical context. These examples will help you understand better. Imagine a scenario where one of your customer has decided to buy from you a pair of Brand X sunglasses. One of the ways to achieve this would be by offering this customer another pair of sunglasses from Brand Y, which is expensive as compared to X. While presenting such options ensure that you can justify the rise in price with features of the product or in some cases even the brand value. Alternatively, you can also offer the customer a pair which has a better warranty option. Even if the option is slightly more expensive, the additional warranty is a tempting deal for your customer which might just convince them to shell out the extra money. In both the above scenarios, you are trying to sell something better to the customer. So, proceeding further in the above situation, you can show the customer an accessory like a cleaning cloth, a stylish case, etc. 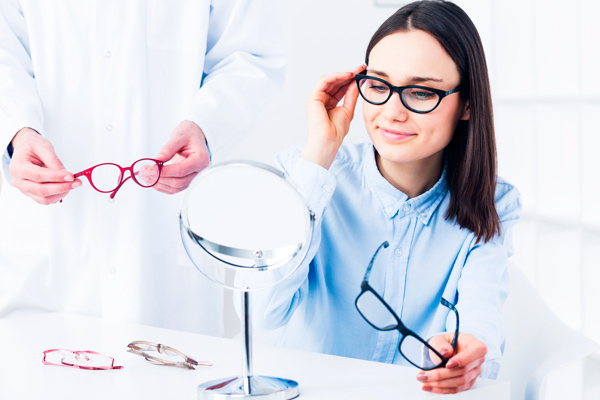 Basically, you, as the optician should try to sell something that is high on utility and adds value to the eyewear that your customer has already chosen to buy. Here, as you would have already noticed that while upsell tries to improve the sale, cross-sell aims towards generating complementary sales. But in spite of the variation, both these strategies are very powerful in improving the business revenue by substantial margins. So, if you haven’t been actively using the upsell and cross-sell approach in your sales strategies, making the change can actually help your business grow. Here is a look at few simple techniques that can help you implement the upsell and cross-sell approach in your daily sales and target your customers in a better way. Why cross-sell or upsell approach can help your business? It builds stronger relationships with customers: If done correctly, upselling and cross-selling can help you build long lasting relationships with the customers. While employing these strategies, you should not just be thinking about adding to your revenue numbers but also about offering a better and more valuable product to the customer. This will help you ensure the loyalty of the customer in addition to adding to your profits. It is much easier to sell to existing customers: Finding new customers can be both time-consuming and expensive. Comparatively, it is much easier to know your existing clients when it comes to factors like spending capacity, eyewear preferences, etc. This information will empower you to offer them more valuable products or products that complement their individual purchases. Don’t expect your customers to always buy from you when you are upselling or cross-selling. However, there are ways in which you can urge them to play along. For example, when you are trying to upsell contact lenses from a high-end brand with a discounted price, make sure that you are placing that discount only for a limited amount of time. The time can vary from a week to a month. This makes the offer more tempting. And more importantly, the product being available at a discounted price only for a limited time will create a sense of urgency and the chances of the customer following it with a purchase will be higher. Basically, letting the customers know about items going out of stock or offers being available for limited periods of time will only add more value to the offer. To increase your cross-sell/upsell conversion rate, you can gift your customers whenever they tend to make a purchase as a result of your upsell or cross-sell strategy. This will not just make them feel special about their purchase but will also encourage them to opt for such purchases in the future, when they visit your store. Something as simple as a free eye check-up could be enough to build the required trust and make the customer happy. Another way in which you can introduce gifts is by offering them a certain discount whenever the customer purchase exceeds a certain amount. For instance, if the customer spend exceeds X amount, then he or she gets a free repair coupon for his frames. Whether you are upselling or cross-selling, psychologists suggest that the difference between the old price and the new price should be a whole number. Research states that this increases the chances of a successful conversion. So, if you are up-selling a high-end frame and if the price difference is a whole number, then you can inform the customer saying, for just INR 500 more you can get a better frame from brand X. Showing a new product to the customers might not be enough for a successful conversion. Remember that we live in an era where the customer demands an omni-channel experience. And so you, as the optician, have to ensure that the customer gets more than just the ordinary in-store purchase experience. In fact, just showing the new product can even end up as counterproductive if the customer feels that you are trying to lure him into making an expensive purchase. Hence, it is important that you make sure the customer sees the value in the new product or the complementary products that you are trying to sell to him. For example, if you are selling a product with an extended warranty, you can convey the advantages of this option and how it actually adds value to his or her purchase. Rather than the offer itself, the way you put forth the offer might be the differentiating factor between a Yes or a No from the customer. For instance, let’s say your customer wants to buy a pair of lens and frame from you. Here instead of offering him a different coloured frame as an added purchase, you should show him a lens and two frames as part of the initial package. The customer should then be given the option to take out one of the frames and reduce the price. Now, instead of making a decision of an additional purchase, the customer has to decide whether or not to give up that additional frame, which in most cases will work in your favour. Finally, irrespective of the tactic that you use, it is important to remember that adding value to the customer’s purchase should be your primary goal. Even the best tactics won’t work out as expected if they don’t do this. Cross-selling and upselling are great ways to boost your sales but it is equally important to ensure that they end up in win-win scenarios for both you and your customers.